One of the best home theater installation companies in Dallas! Cons: Can be a little expensive, but worth it! Cons: I ordered for the deep cleaning of 300$ They didnt mop the floor properly the washable paints are every where!!! They didnt cleaned the doors properly. And they removed the rugs .. I had brisket meat balls and some french fries. The cocktails were best priced and very tasty. The atmosphere of the place was pleasant. Would definitely come back. I often come here with my friends. The best dish i have tasted here is brisket balls and the toffee cake. Especially the Creamy cake. The ambiance is too ..
Renovations By Riley did all of our cabinetry (kitchen, bath, plus built-ins) in our extensive remodel, and we have been very pleased with the work! Great work from a great ..
A bit north of downtown Dallas you?ll find the area known as Knox-Henderson, which is actually named after two streets that run through Central Expressway. 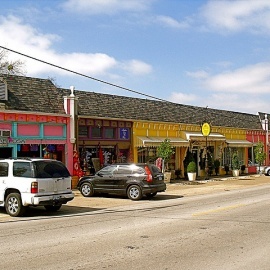 Full of antiques, upscale shopping, a variety of restaurants and martini bars, the Knox Henderson nightlife as well as daytime events provides something for everyone to do. Familiar places include Pottery Barn and Cheesecake Factory but don?t be afraid to try something new. The Barley House, Candle Room, and Cuba Libre Caf� are well worth stopping in! Knox Henderson shopping has a lot of interesting and unique things to offer! This area is also one of the oldest in Dallas. Much of it was built in the 1920?s and historical preservation was undertaken in the 1990?s to help keep the district ready for visitors. Knox-Henderson nightlife includes many themed clubs which always remain busy on weekend nights. If you are traveling, the area is also easy to reach from US 75. Transportation isn?t much to worry about. The Knox-Henderson district is only a few blocks long. Many people just park their cars and hop from bar to bar, or shop to shop.